Are Looking to build an external ZX81 or Timex 1000 keyboard? Then I have just the 1982(ish) document to get you on your way. As part of a recent Ebay acquisition of some ZX81 related books I received an additional surprise. Included in the parcel was a rather good period document from the company 'Mule Electronics' which outlines how to attach and build an external keyboard for a Timex 1000/ZX81. As far as I can tell the text originates from the USA, unfortunately there is no further indication of the Companies address or the exact date the document was produced. 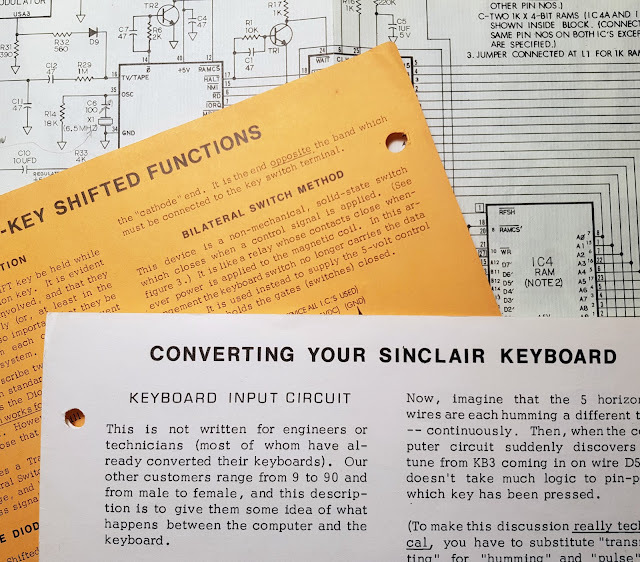 Converting Your Sinclair Keyboard: Loose leaf pages from a great little text. The document 'Converting Your Sinclair Keyboard' provides some still very useful information on exactly how the ZX81s keyboard works and what to look for when building your own external keyboard modifications. Certainly worth a read in conjunction with the other documents out there on the subject. The documents to good not to share and as such I've uploaded the complete text to the Internet Archive so go and grab a copy before starting that keyboard project. A year ago I knocked up the ZeaMouse, a USB mouse interface for the ZXpand and ZX81. 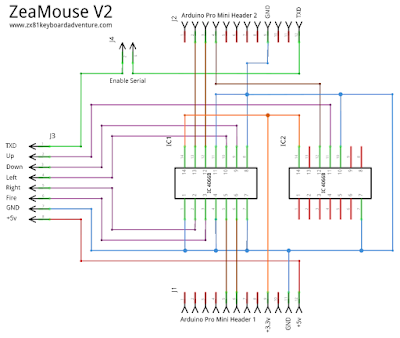 ZeaMouse is a USB to digital mouse expansion board built around an Adrunio USB host shield. A year on it seems like a good time to revisit the project and make some improvements. Last time part of the fun was building a simple Arduino clone as part of the ZeaMouse. Unfortunately this kept the size of the end product much larger than it needed to be. 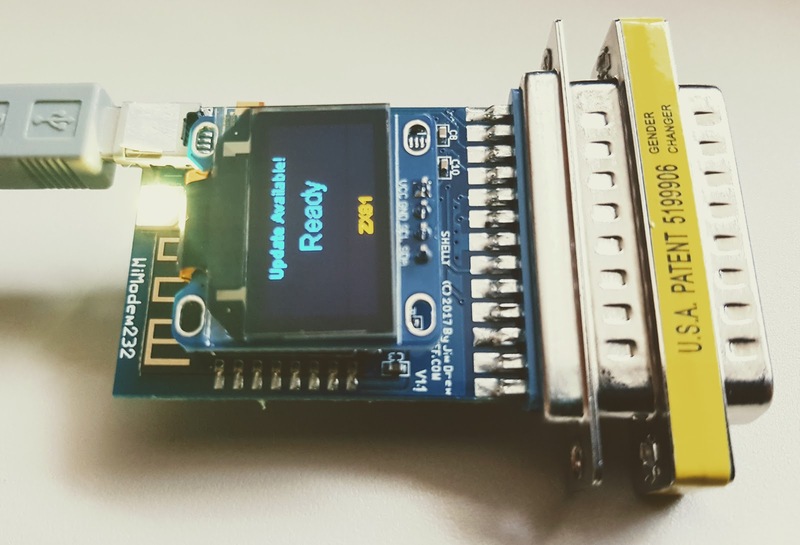 This time an Arduino Pro Mini 3.3v has replaced the DIY Arduino, matching this with a USB Mini Host shield and some additional components on a home-brew shield sees significant reductions in interface size. The USB Mini Host shield forms the core of the project and is designed to fit under an Arduino 3.3v Pro mini. The USB shield has all the abilities of it's bigger brother but does with some but comes with some power supply limitations. By default the combination of 3.3 volt Pro Mini and USB host combination delivers 3.3 volts to an attached USB device. For some hardware the voltage may not be high enough, although all the USB mice (if a limited selection) I've tested have work without issue. 3.3v Arduino Pro Min, USB Shield and ZeaMouse V2 PCB. The USB Host shield can be modified to deliver 5v to connected devices if required. Details of the conversion can be found on the Circuits@Home website. 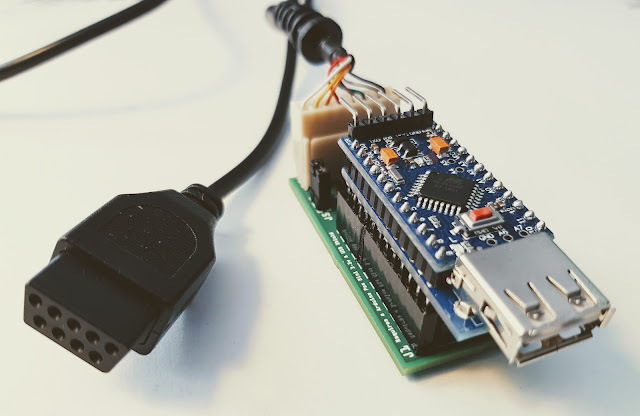 The modification bypasses the Arduino's 3.3v regulator, meaning that whatever is used to supply power to the RAW inputs must be rated a 5v or lower else you risk frying an attached USB device. The ZeaMouse is powered from the 5v lines on the digital joystick port, so the modification is fine for our purposes. (But check your Micro Computers Specs first). I decided against using 4066 switching ICs on ZeaMouse V1 as it made designing the single sided PCB a lot simpler. This time, with design simplicity and ease of build-ability screams for the use of 4066s. With the Arduino Pro Mini operating at 3.3 volts and the ZX81 at 5 volts, 4066s provide a simple way of keeping these conflicting voltages separated. Although I got a couple of double sided test PCBs fabricated, the ZeaMouse boards are pretty much designed with home PCB making in mind. Only the bottom of the board really needs to be made up. There are a couple of via's must be connected with some straight wire on the top of the board should you choose to build a single sided PCB. Building the interface is straight forward. The hardest part is probably soldering the Pro Mini and the USB shield together. Constructing ZeaMouse shield itself is a breeze, and will only take about 20 minutes maximum. Other than two 4066s, the only other components required are pin headers and IC sockets, although all of these are optional. 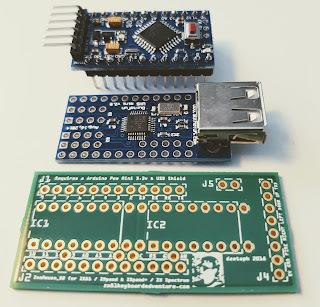 The Arduino and USB Host along with the ICs could be soldered directly to the shield PCB. The only required header is J4, used to enable or disable RS232 communication with the ZXpand. 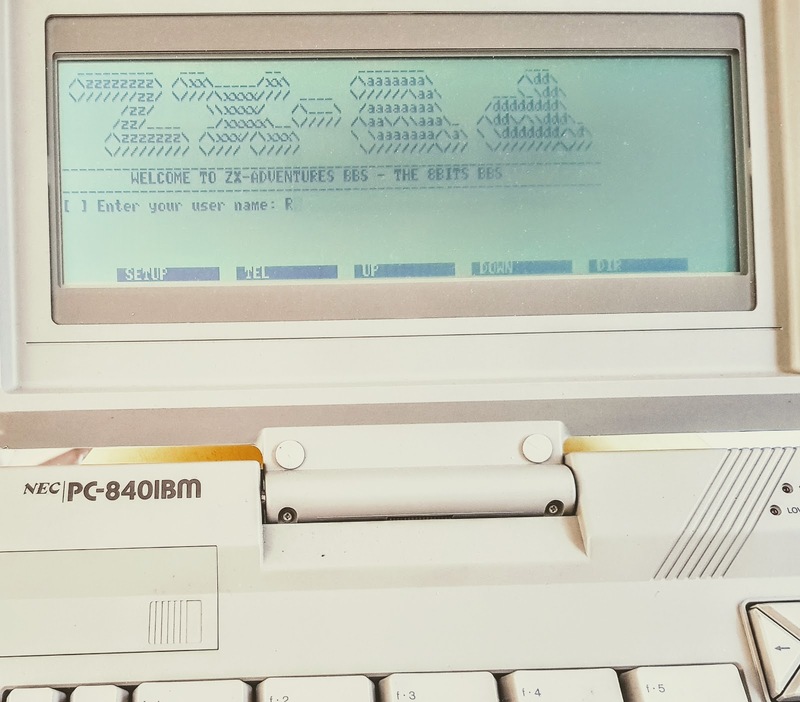 J4 should be left open if using the ZeaMouse on any micro computer other than a ZX81. The connection pads or pin headers on the far end of the shield board should be wired up to an Atari joystick cable or DB9 socket. I had a cable from a broken controller to hand; care needs to be taken re-purposing cables for fear of sending 5 volts down the wrong line. The TX serial out is the one non-standard connection, it's specifically for the ZXpand+, and should be routed to RX on the ZXpand+. Next time I'll cover the firmware and take a look at the mouse in action. 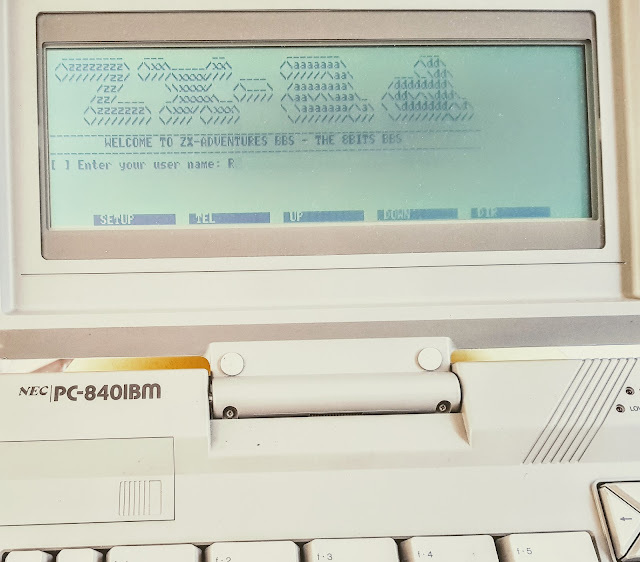 No need to wait until then if you're keen to get going; All the files and firmware required to build the interface are a already available on the ZX81 Projects and Programs to Download Page. After several weeks of waiting the Decoder Board PCBs arrived just in time for a bit weekend assembly and testing. I'd ordered the other components required for the build a couple of weeks ago and had them laying around in anticipation. Aside from the various electronics, I decided to use a ZX81XT extender board purchased some time ago from Sell My Retro. The ZX81XT is perfect for prototyping or just for swapping various project boards in and out without the need for multiple edge connectors. As my decoder board at its core is a part for part update on the original design as presented in the 'Easy add-on Projects for Spectrum ZX81 & ACE' book, I pretty much followed the general assembly instructions given in the text. This process was exceedingly helpful during the various testing phases outlined during the build procedure. The major update in my version of the decoder board is the substitution of through hole components for SMD parts. Being the first time I've willingly used SMD parts I was expecting quite a challenge. 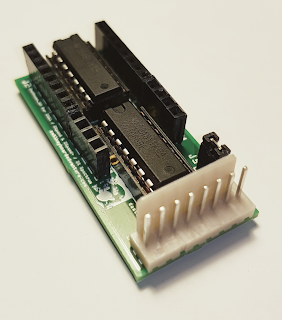 The good news for anybody else finding themselves slightly apprehensive of incorporating SMD components into projects is that it's actually quite easy to use them. The most problematic parts I found to be the tiny resistors and capacitors. I managed to loose a couple of the minuscule resistors by simply dropping them into someplace never to be found again. Dealing with and soldering of the SMD ICs in comparison was all very straight forward. After about an hour and a half I had the decoder assembled ready for some final testing. This is where I hit a slight snag. The first project in the book, 'Pulse Detector' serves as the final assembly test for the board. Unfortunately I neglected to order the ICs required for the test project. I figured it should be possible to conduct some testing with a simple 555 timer circuit. I did however wish to ensure that what ever it was I built would be genuine test of the decoder. 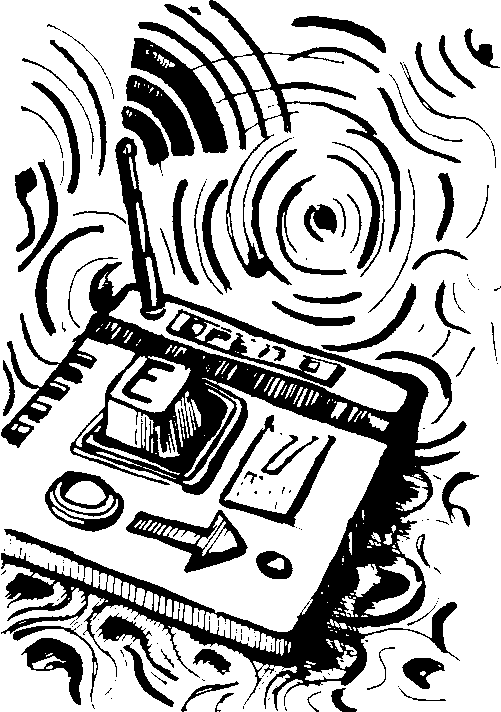 Luckily the book had such a 555 timer circuit I could easily modify, 'Project 5, Beeper'. Simply removing the Beeper part of the circuit (which I also had no components for) and replacing it with an LED would prove the board worked. LED 555 Test Circuit Connected and Working on a Spectrum Omni. I first tested the Decoder Board on a ZX81. This requires entering a program listing appearing in the books appendix. 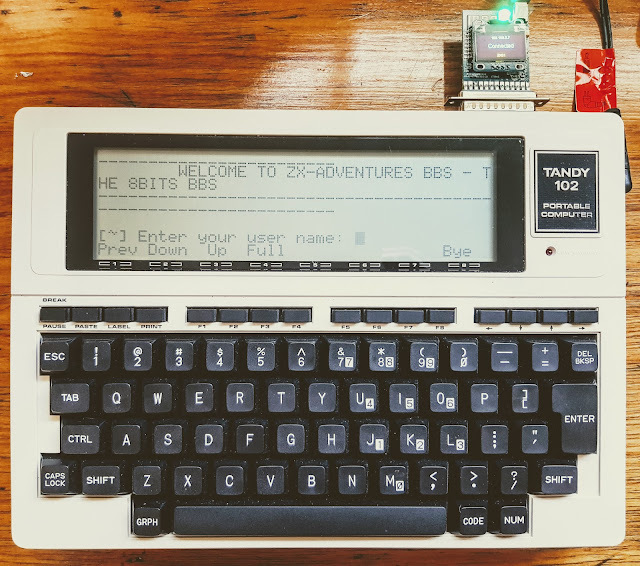 The ZX81 has no built in BASIC commands to read or write to expansion BUS, the programs listed in the book addressed this absence. After entering an running the application I successfully blinked an LED, a positive right of passage for any micro controlled project. 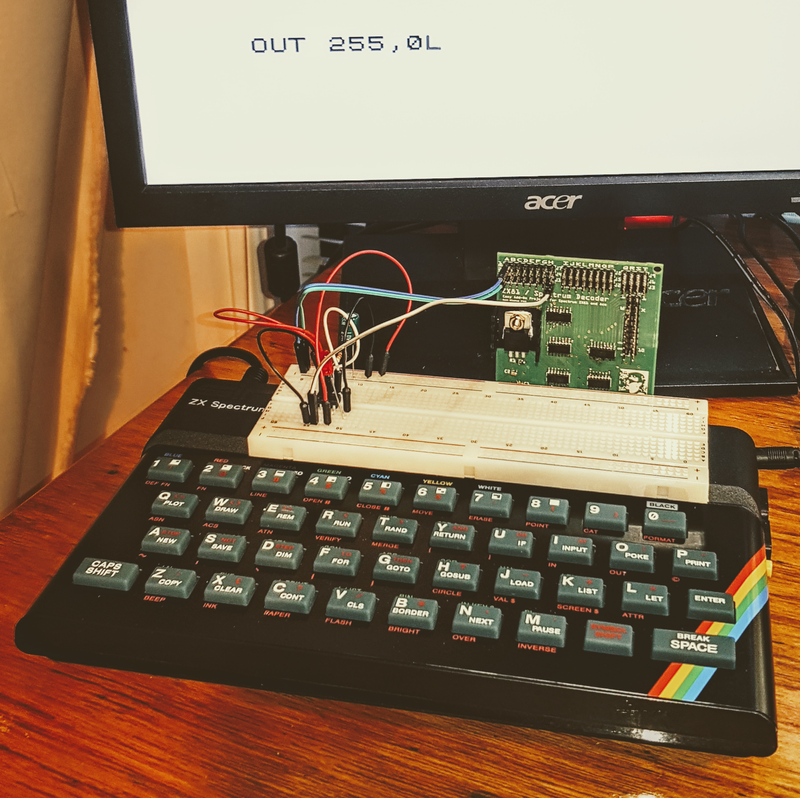 I then moved the decoder board across to my recently acquired ZX Spectrum Omni (deserving of it's own blog entry sometime soon). Again the LED blinked as expected. All in all everything has worked as expected, time to pick up some extra electronics and build some of the books proper projects. 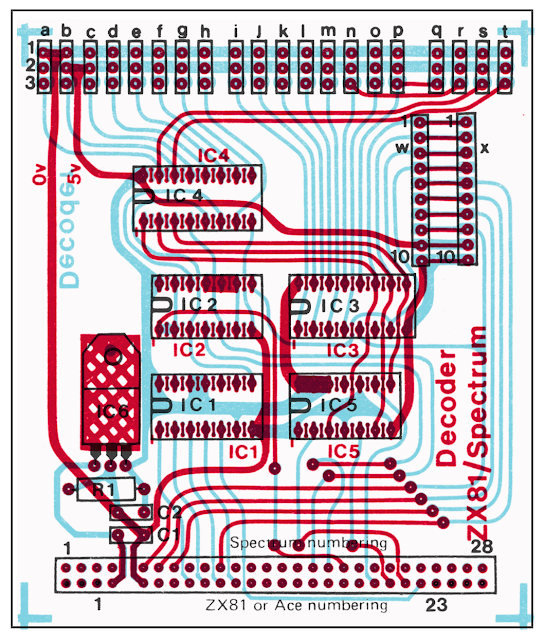 In the previous blog entry I left off before starting design work on the Decoder Board. 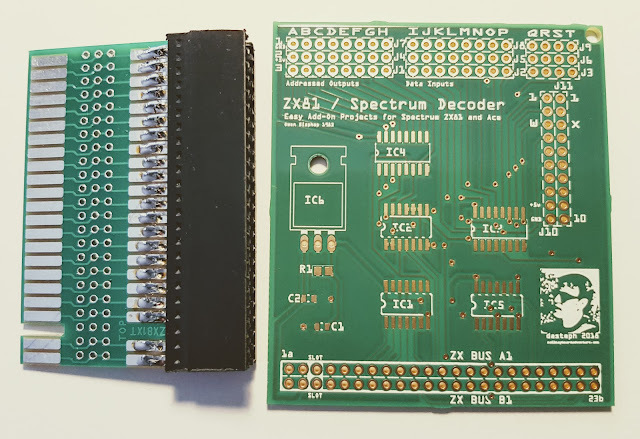 The board is an essential build before attempting any of the 'Easy add-on Projects for Spectrum ZX81 & ACE'. In reality it's the first project of the book, even if it's not fully described until Appendix A. First up I needed to transfer the circuit diagram provided in the book into Fritzing and build up a new circuit board compatible with the ZX81. I really could have made life easier for myself simply by printing the circuit board designs included within the book. My plan however is to use surface mounted ICs' instead of through hole components, both modernising the design and shrinking the boards footprint. My intention was also to follow the original Decoder Boards layout reasonably closely. 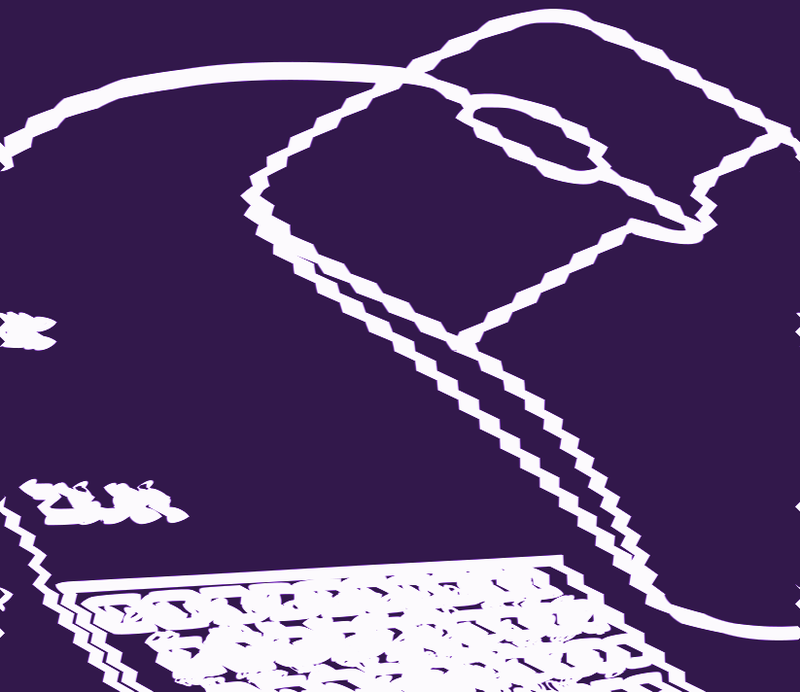 Ensuring any projects described by the book would still be referential to the end product. 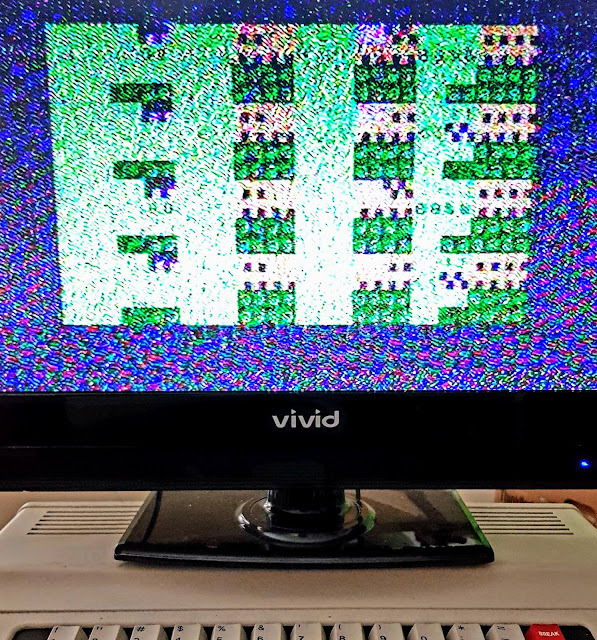 My main concession was to design around the shorter ZX81 edge connector only. 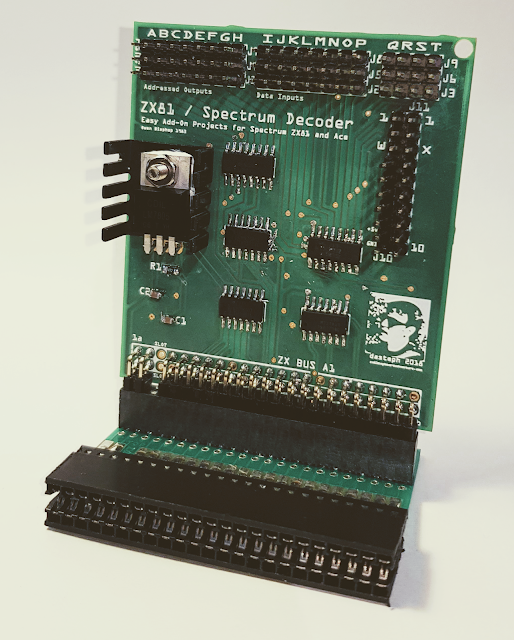 This does not prevent a ZX Spectrum from using the device as a Spectrums' BUS is compatible with all signals used by the board. To make life somewhat easier I combined the top and bottom layers of the circuit board layout presented in 'Easy add-on Projects' pages 166-167 into one image. Using the composite picture as a guide I began the layout my board. 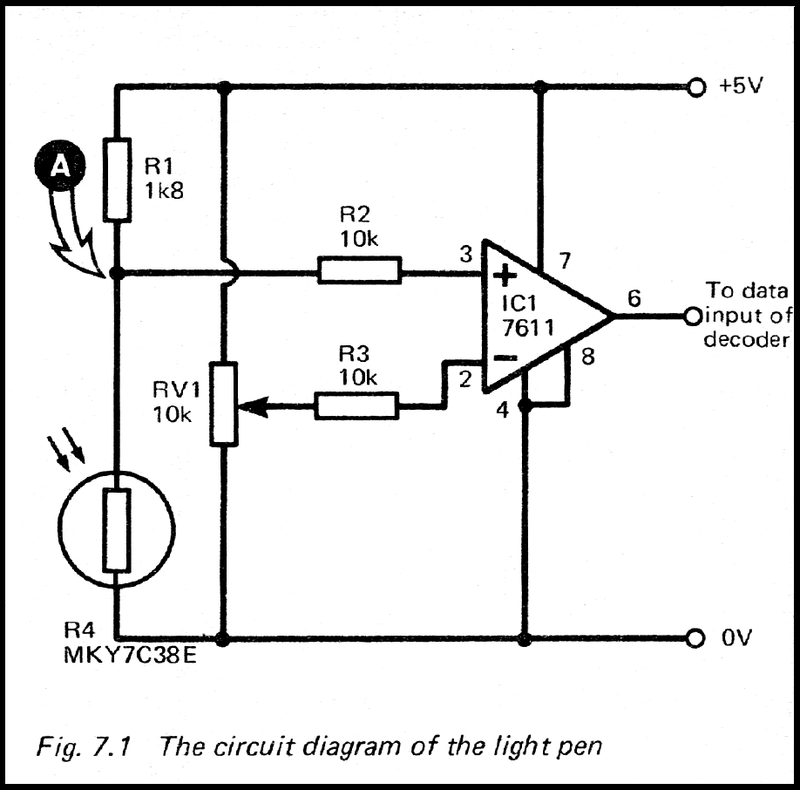 I'm quite glad I took this route as I noticed a couple of minor errors I'd made in transcribing the circuit diagram. 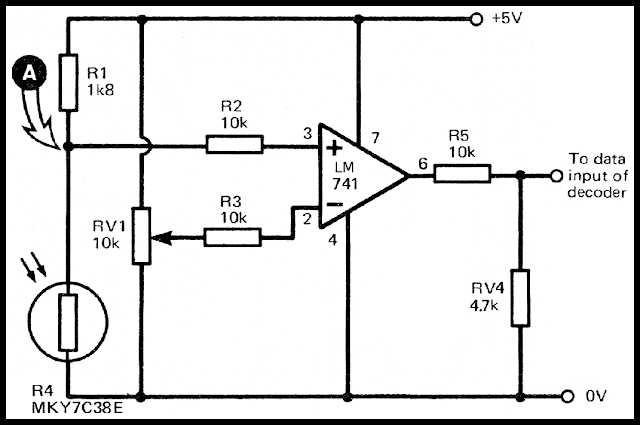 More interestingly however the described circuit didn't seem to match with the board layouts provided by the book. Composite Image of top and bottom board layouts as taken from the book. A couple of traces from IC2 to IC4 appeared to be different between the books board layouts and circuit diagram. This was more than a little confusing. 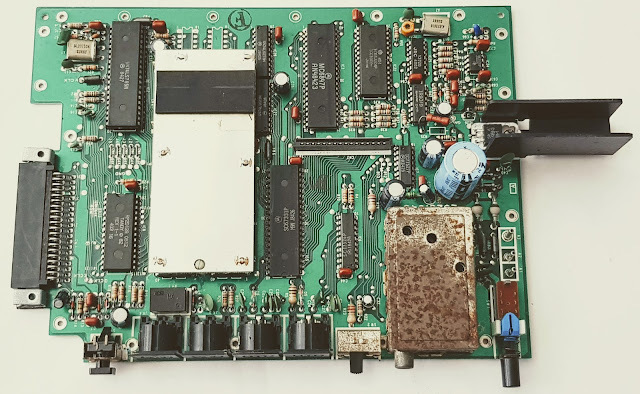 I checked the Jupiter Ace board layout (also in the book) against the ZX81 / Spectrum boards, and the designs seemed consistent. 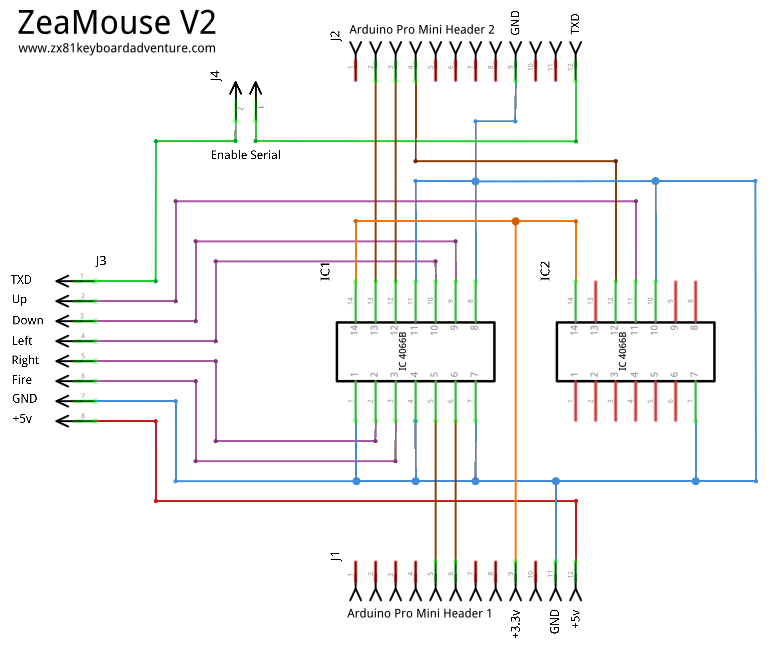 I decided to go about about updating my circuit diagram, bring it in line with the book layouts. After quite a bit of triple checking I now have a circuit board design ready to send off for fabrication. My new (mostly) SMD board is approximately half the size of the original design, good for keeping fabrication costs down. I've also added a few extra clarifications and helpful labelling to the silkscreen layers. Now to order some parts, check the design again before sending it off and hope for the best. 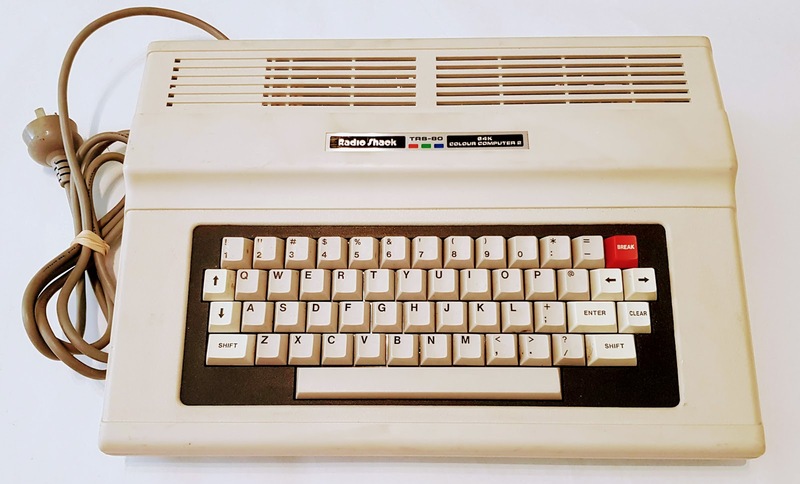 There was a time when plugging a home fabricated electronics project into, onto or out the back of a Computer was an actively encouraged pursuit. Hardware project books for many a micro computer filled bookstore shelves which intern were filled with many a hardware DIY add-on. 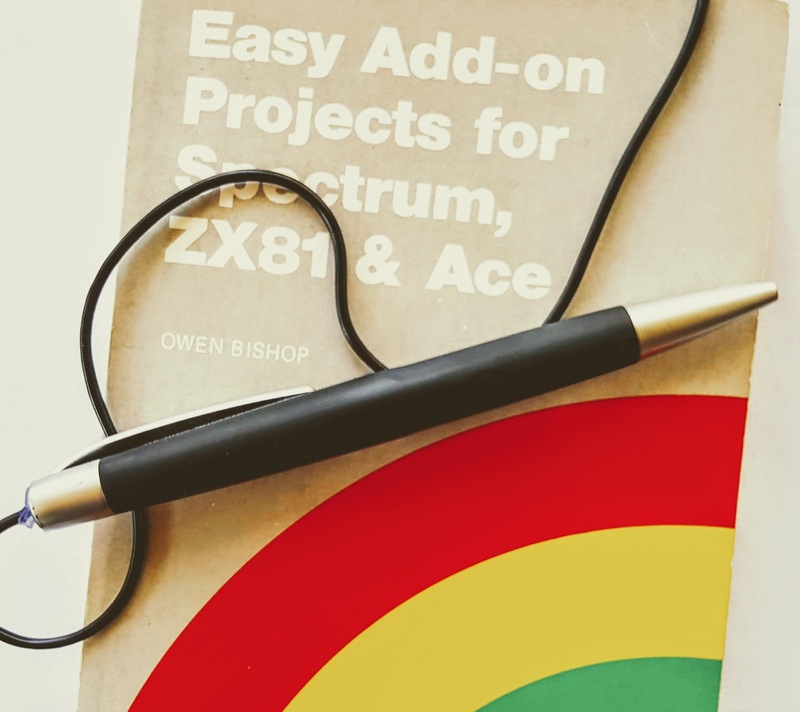 Easy add-on Projects for the Spectrum ZX81 and Ace, was one such tome of 80s knowledge, and it's been taking filling space on book self for a couple of years. 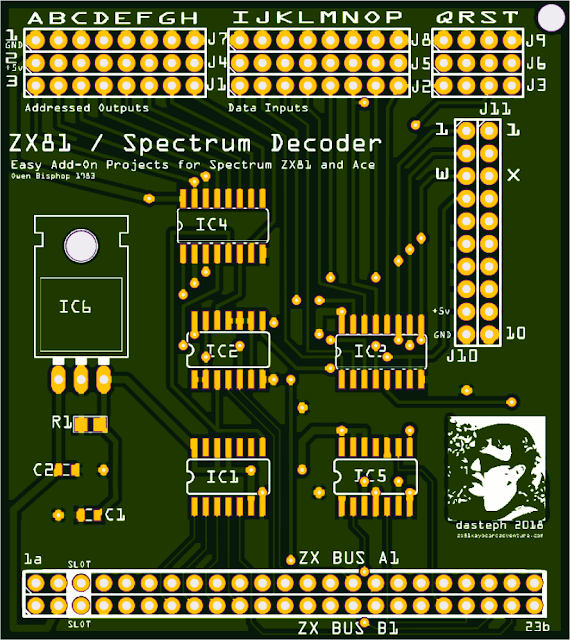 In order to undertake the builds presented within Easy add-on Projects for the Spectrum ZX81 and Ace, an initially requirement is the construction of an Address Decoder board, itself obviously already an project. In the true maker spirit of the times this involves producing your own PCB. There was at one point an order-able companion board, leasoning the difficulties any period 80's enthusiast lacking in manufacturing resources would face, though notably you still had to populate the PCB with components yourself. 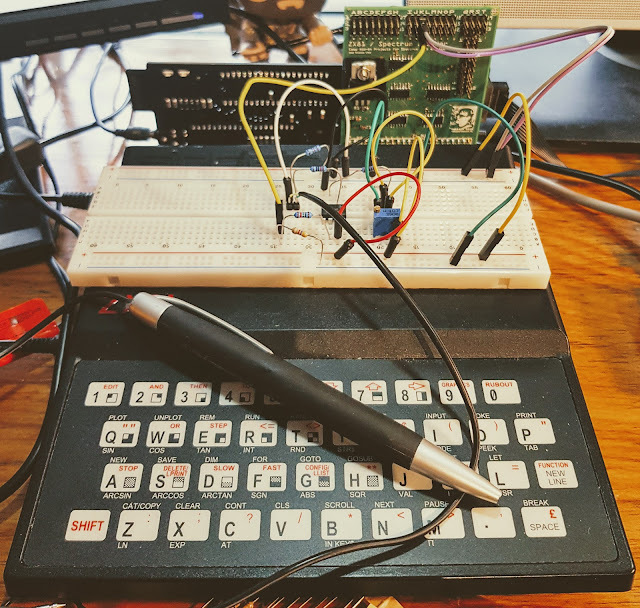 The (non-Address Board Creation) projects themselves are quite an interesting selection, ranging from a primitive scanner, a light pen, a lap counter and to the major project a weather station. Not surprisingly they all have a very 'you could do this with an Arduino or Raspberry Pi' feel to them. 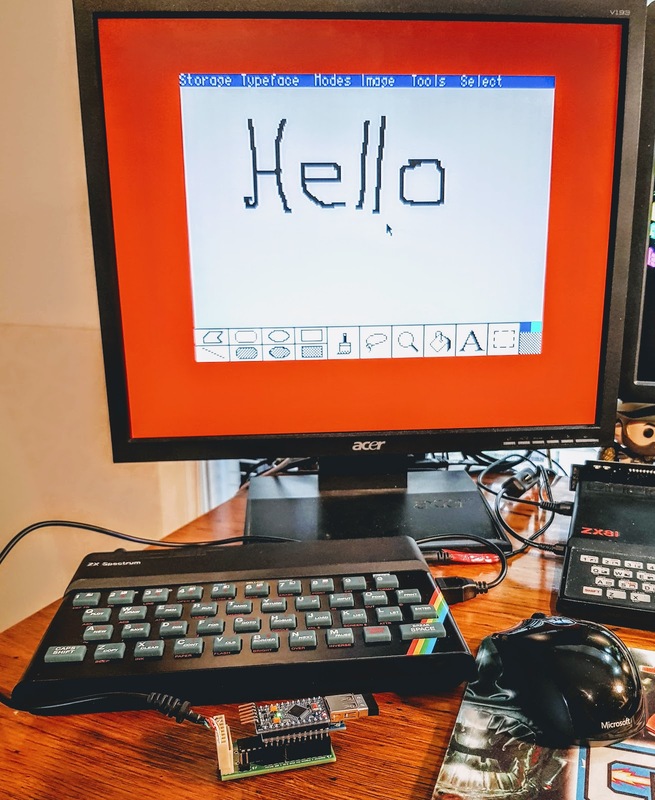 In considering this vibe, it could also be a fun aside to implement the same on either of those modern devices, or the other way around by bringing some Arduino projects to the ZX81. Lets not get to ahead of ourselves, the first order of business is to get down to that Decoder. There are 2 versions of the board presented in the book, one for the Jupiter Ace and one that's compatible with both the ZX81 and Spectrum, it's this board I'll be constructing. There is not a great deal to it, just a few 74 series ICs and other easy-ish to source parts. 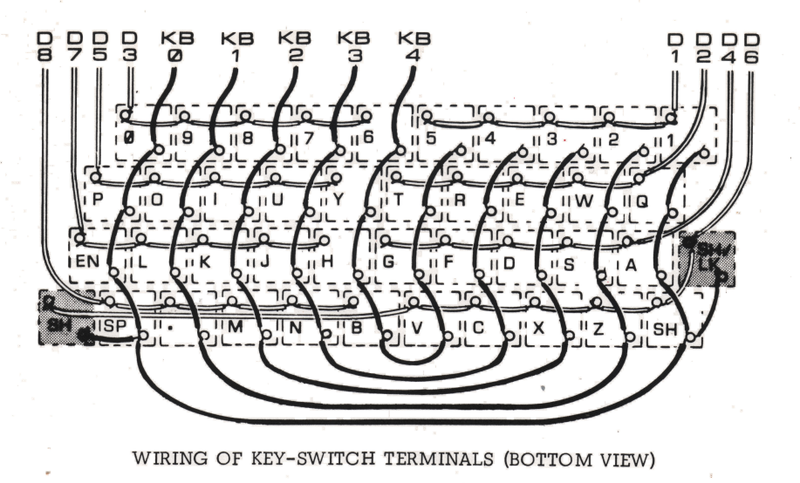 This is one of the wonderful thing about retro stuff I guess, it's all still relatively easy to source and understand. I'm not going to use the board quite as designed, I'm intending to use SMD components for example to modernise construction, in general however there should be no functional changes. So, over the course of the coming weeks I'll get down redesigning the Decoder Board and form there onto the actual projects. 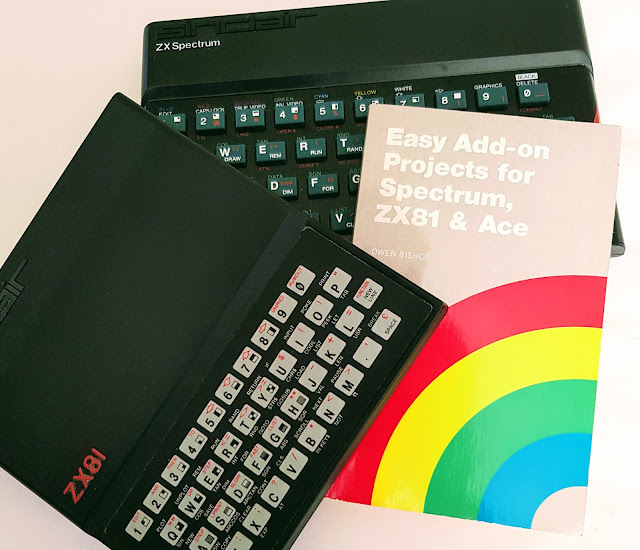 If you playing along at home the book ' Easy add-on Projects for the Spectrum ZX81 and Ace' is available from the Jupiter Ace Resource Archive. A site well worth an explore given the Ace's close links to the ZX81 and ZX Spectrum. In the last few days I took delivery of an Amstrad NC 100 notepad computer that had been listed on everybodys favourite auction site as not working. The purchase was an educated gamble as all my prior research on the NC 100, along with helpful advice from the Twitter Sphere, pointed to the major cause of failure for these devices being an easy fix. A simple blown fuse that would probably require replacing or circumventing. After taking the NC 100 apart, locating the fuse where it should be, in the bottom left corner of the main board (power socket facing towards you), I ran a continuity test, the resulting in our prospective blown fuse scenario proving correct. The non-working Fuse is a PCB Leaded, 500 mA, 250 V component, which I didn't have to hand. So in order to power up the computer I simply removed the fuse and soldered in a copper jumper wire as a temporary fix. (Next time I place a general component order I'll obtain a new fuse.) This is fine, just as long as I insure the polarity of any power supply is correct, Tip / Outer positive, inner negative. Interestingly, based on the type of fuse I found in my NC 100 , there seem to be a couple of revisions of the NC 100 board. A number of online references indicate that the fuse should be an SMD component, not a though hole type one. 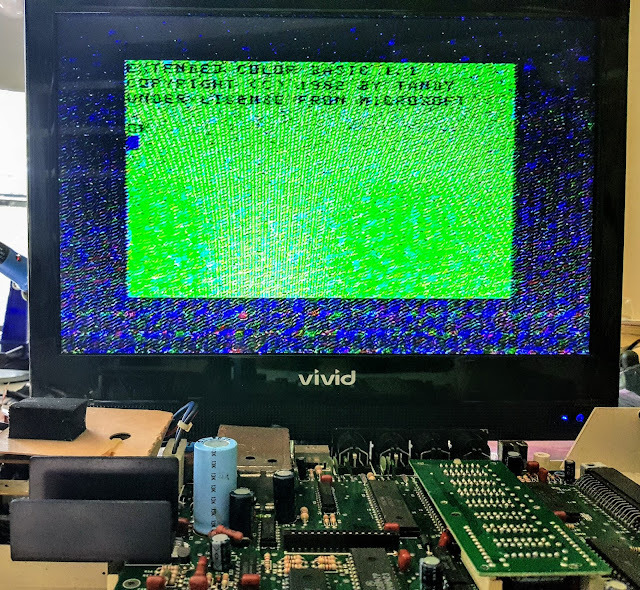 To test, I reconnected the main board to the LCD panel, and screen came to life with a Friendly 'Lithium battery is low' warning, not unexpected as there was no backup battery in the device at the time. 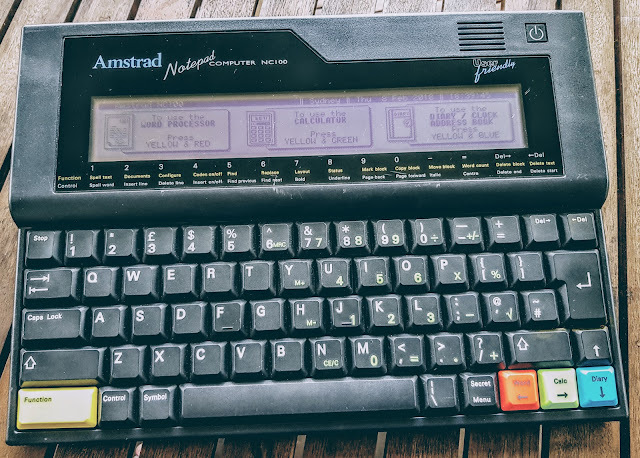 Fix completed, and case reassembled, and I'm now the proud owner of a rock bottom priced Amstrad NC 100. Now to find something for this little notepad computer do, maybe I'll take it to the office and garner some curious and possibly concerning looks at meetings. 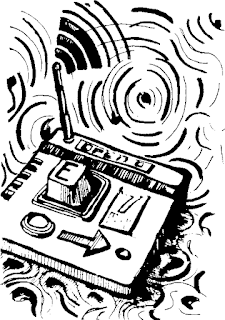 One of most noticeable graphic element lacking from a ZX81 is perhaps the ability to define said graphic elements. 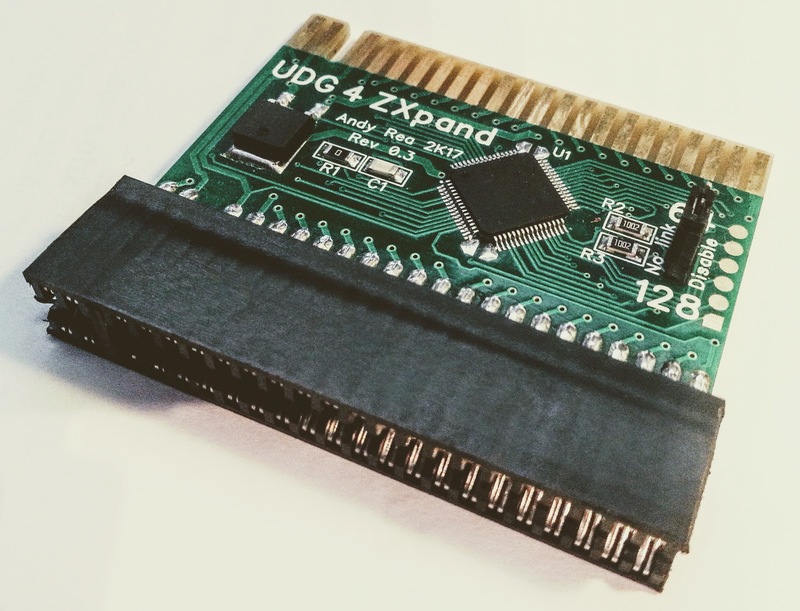 Enter the UDG for ZXpand from Andy Rea, an expansion module available from around mid 2017 that affords the ZX81 owner the opportunity to create User Defined Graphics. The UDG for ZXpand is designed to be used in conjunction with memory expansions supporting the WRX extensions / modifications. Modern memory boards such as the ZXpand(+) and the ZXblast support this natively. Note that if using period RAM expansions such as the 16k Sinclair RAM pack or one from Memotech, then hardware alterations are required. 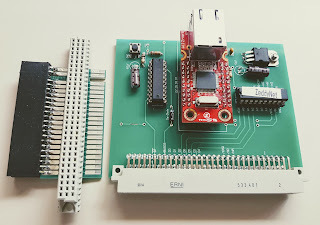 The UDG 4 ZXpand Expansion Board. For an expansion board the UDG 4 ZXpand is quite small, being the width of the ZX81 expansion bus and approximately as deep again.. 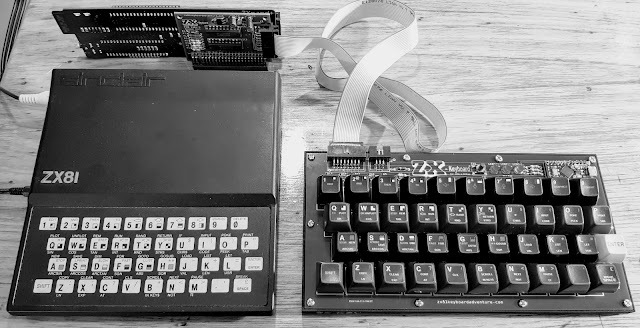 The expansion is designed to slot horizontally and directly into the ZX81 expansion port, and to be sandwiched between a ZX81 and supporting RAM Pack / ZXpand / ZXblast. 64 Mode: Sets the UDGs to a defined limit of 64 Characters. A further 64 characters will be inverse versions. 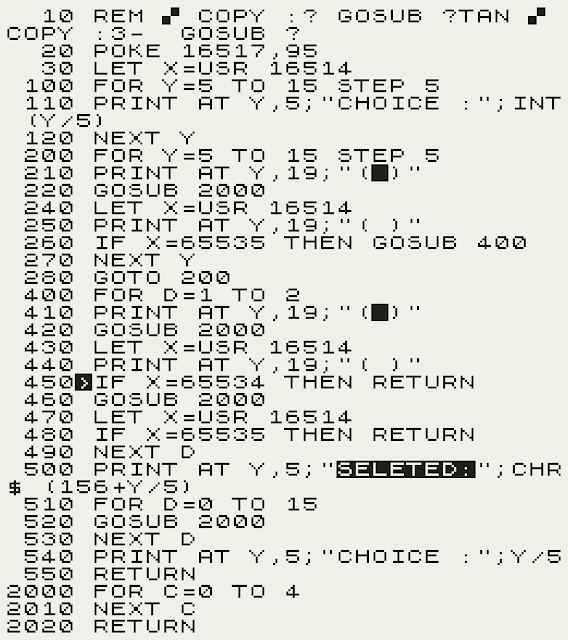 128 Mode: All available ZX81 characters can be redefined and made available. 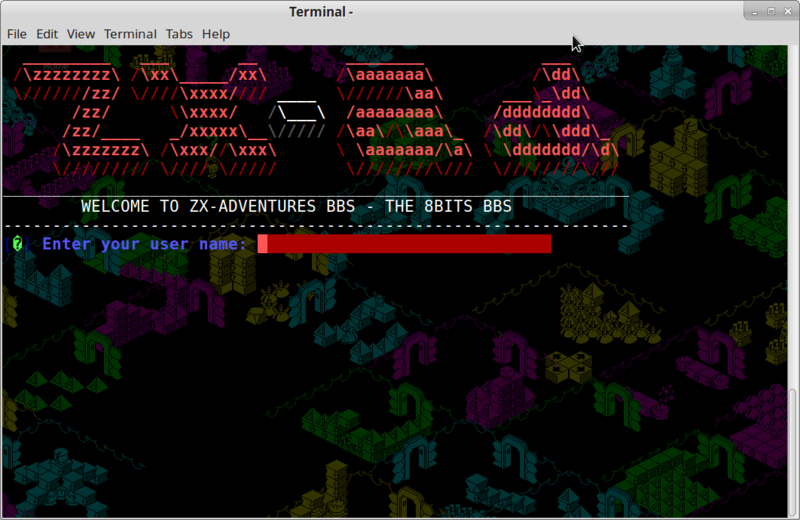 Modes 3 in particular provides scope for a complete overhaul of the ZX81s character set. Need some lower case characters, then replace the otherwise seldom used inverse set with something more useful. I'll cover the creation of character sets and the importation of existing fonts in a second post / article. It's also worth noting that the UDG 4 ZXpand is supported by the 1.8 release of the EightyOne Sinclair Emulator. A fast paced arcade game, Galaxians exemplifies just what a standard ZX81 can deliver when asked nicely. With the addition of some well done UDGs Galaxians is elevated to a whole new level, the game rivalling the best early games the ZX Spectrum has to offer. You can grab the updated version of Galaxians Thanks to Moggy on the Sinclair World Forums. Be sure to search for other updated tittles while there. The results of redefined character sets on old games depend largely on the quality of the original, or simply revolve around just how the pre-existing Sinclair character set may or may not have have been used. Even in the otherwise brilliantly updated Galaxians there are some oddities to be seen due to this specific limitation. This is most apparent in the Hi Score tables where an "*" character, normally used in game as a player bullet, leads a certain illegibility the player score listing. Updates to older games is all well and good, but endowing a ZX81 with near ZX Spectrum like powers (minus to colours) the UDG for ZXpand stands to have major impacts on many a new games releases. There are effectively no limitations plaguing new tittles , these having the potential to provide complex experiences with a full usage of UDGs. 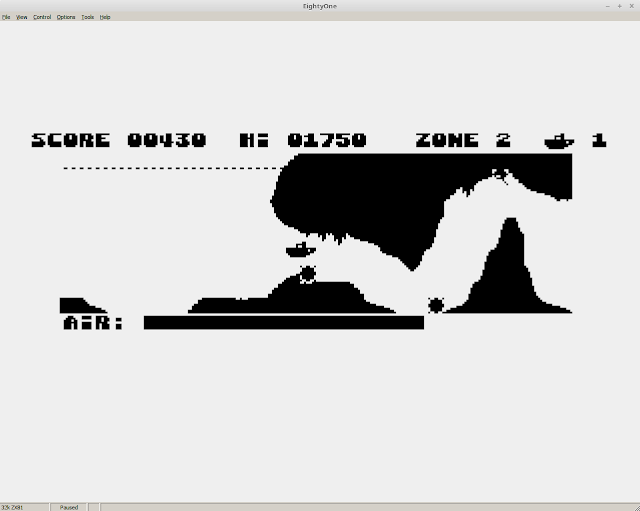 The first of brand new title being Ze dragon, a game so professional it's hard to believe a ZX81 is running behind it. A clone of Atari Sea Dragon, Ze Dragon is a Scramble like game replacing other worldly action with a Submariner adventure. Ze Dragon was released in late 2017, and February 2018 has seen it updates to Ze Dragon II. 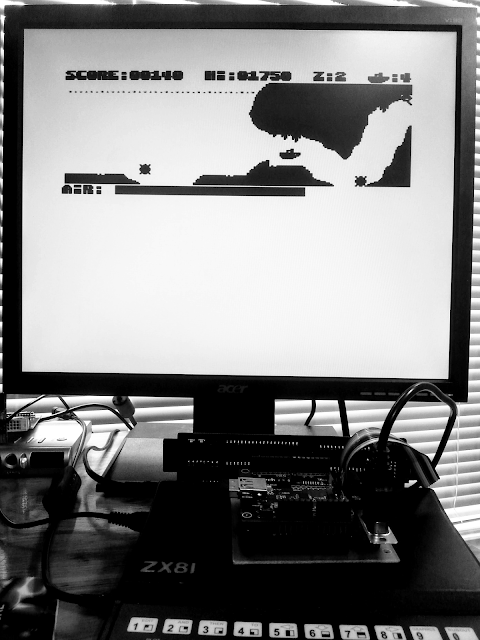 The new version features pixel level scrolling, something not before seen in a ZX81 game. (Perhaps some parallax scrolling in version 3?). 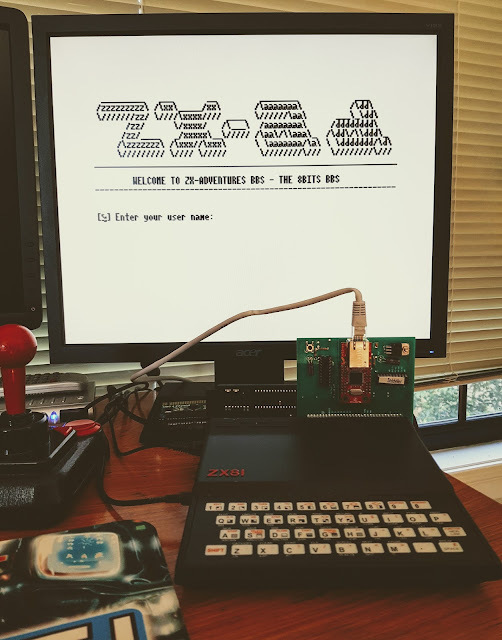 Ze Dragon is an impressive conversion, demonstrating the full capabilities of the ZX81, UDG for ZXpand and the ZXpand(+). Perhaps this is not so surprising as the creators behind the both the UDG 4 ZXpand and ZXpand are behind the game. Game Author Sir Morris (Charlie Robson of ZXpand fame), Andy Rea and other co-mariners should be justly proud. 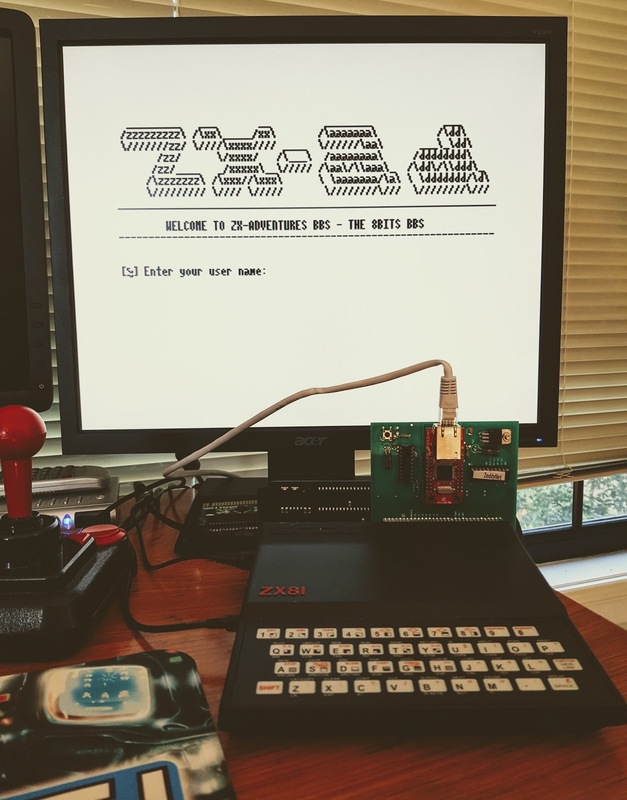 As with Galaxians, Ze Dragon 2 is available over at the Sinclair World Forums. Well that's a basic review and some games covered, so what about using Andy Reas' clever little device to do our our own bidding. Next post I'll attempt to cover some basics on generating our own UDGs for own games and programs. Covering some simple coding, then moving quickly onto some software that's already available to take all the hard work out of generating new ZX81 characters sets.